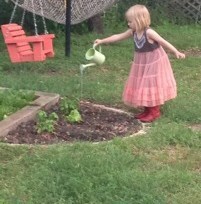 Our environment is our teacher, play is our work, and our learning happens naturally. 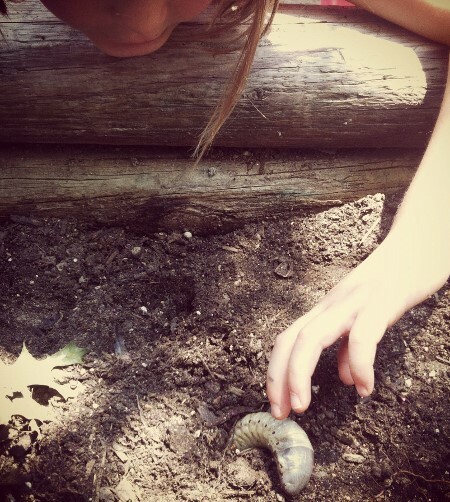 I want the children to feel powerful through kindness to others and connection to nature. So much of learning in schools is inside, sedentary, and screen-based. . . . I worry that preparedness has taken precedence over play. Our school and other great ones like it have reorganized these priorities. Environmental education and nature-based preschools—sometimes called “forest schools”—are expanding across the globe. The movement is so strong in North America now that this summer hundreds of educators will gather at a conference to share their knowledge and present their research and experiences. 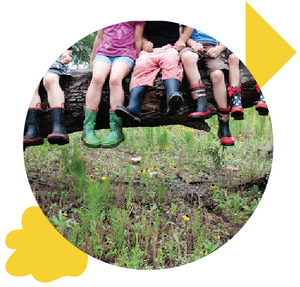 I wanted to know more about the varieties of nature-based preschools in Austin, so I interviewed a few educators with different perspectives and many shared goals. Wendy Calderón is the founder of The Dragonfly Forest in Cedar Park, which is just one year old and enrolls ages 3 to 5 in a program that includes Spanish and English language learning. Nicole Haladyna started Woodland Schoolhouse in Travis Heights in 2014. The Schoolhouse enrolls children 3-1/2 to 5 years old in a program inspired by the Reggio Emilia approach. 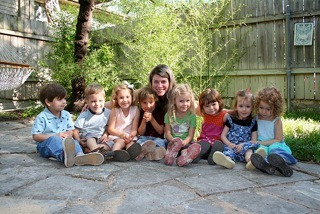 Britt Luttrell teaches at the City of Austin’s Nature’s Way Preschool, which was founded way back in 1992 at the Austin Nature & Science Center. It’s part of the city’s initiative to educate young people and families about environmental stewardship, and it enrolls kids 3 to 5 years old. Tell us a little about what inspired you to become a nature-based educator. Wendy: My biggest inspiration is my daughter, who is two years old. I was teaching at the KIPP Comunidad school and loved it, but after my daughter was born, I decided I wanted to create an environment where she could grow and explore nature—and that idea transformed into Dragonfly Forest school, with a lot of support from family and friends. I started with summer camps, then a few months later I was fully enrolled. I never saw myself as a business owner, but isn’t it beautiful how our children impact us everyday?! Nicole: I was teaching at a more traditional school, but I sometimes looked longingly into a forest area where the kids were not allowed to go. One day we did a special project searching for a particular tree, and it was the best day ever. Then I stumbled across a video about one of the forest schools in Sweden. It was so moving that it actually brought me to tears—and that told me that nature education was what I needed to be doing. After that, I worked at the Discovery School and learned a lot about a nature-based curriculum, and all the right procedures, and how to transport kids, and was able to transition to my own school from there. Britt: I grew up in Austin and have seen it change, so I value green spaces in a bustling, urban environment. I want to show children of all interests and comfort levels that there’s something outside for them to enjoy. Our school is unique in its location because it isn’t in a forest or state park. There are highways, traffic, and towering city buildings. I want kids and their families to know the benefits of nature play and that even the tiniest green space can accelerate physical, emotional, and social development. Could you describe a typical day at your school? Wendy: We start each day with morning circle, singing songs and reading. We do our math by counting chicken eggs and then the kids often play in the “mud kitchen.” They have tea parties and make cakes and they just love to jump in the puddles and make mud angels. They’re dirty and happy. We might then go into the garden and sing into watering cans to explore changes in our voices, then water plants, and turn the compost. 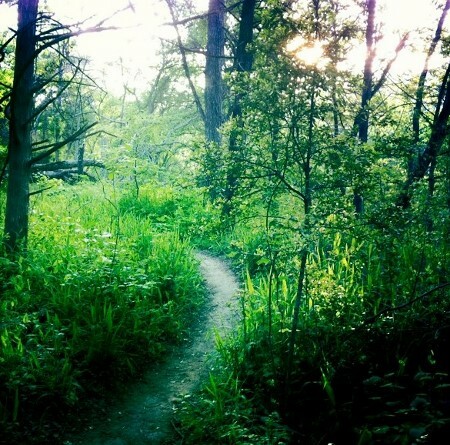 Then we go to our meadow and forest to play pretend games and climb trees—and look for deer. After lunch, we have art, music, and a yoga game that’s like Simon Says, where I call out a pose and students imitate it. Nicole: Each day is so different, but for example: We might start out inside with an hour of free play with play-dough or rocks and minerals or dress-up clothes. Recently some kids wanted to play ninjas, so we pulled materials out of the closet, and after about 30 minutes they had created costumes with gloves and shoes made of masking tape and ribbon. They got so involved in the creation of the costumes, they forgot about the game! We always go for a hike to a few usual spots by a creek to look at turtles and birds. The kids climb on rocks and jump in the water, balancing and learning to use their whole bodies. They make pretend salads with leaves and berries. Afterward, we’ll have a resting time when they can draw, write, or read—but a lot of them sleep after all that activity. Britt: We start our day with an hour of social conflict time in our play yard. We purposefully design our environment with too few items: trucks, bamboo shafts, trees to climb. This facilitates cooperation and the right kind of social conflict—in a large school group representing multiple ages and experience levels. All the kids have a short, 15-minute community time inside with their teacher. We meet live animal visitors, including snakes, lizards, and rabbits that the kids get to touch and hold. This is also our sensory exploration time, with multiple bins set up with things like bird seed, sand, and bones. Every group hikes every single day, even in tricky weather. Our three-year-olds might just take a walk around the school at first, but by the end of the year they go as far as the limestone caves on our preserve. What would you like each child to take away from your school and nature-based education when they leave? Wendy: I would love for the children to leave the school with a knowledge, love, and understanding of nature and their environment. And I would like them to be able to impart that knowledge to their friends and families. But I also want them to leave with the tools they need to be successful in their next school: the ability to participate and know that their ideas are valued, to share and be good friends with others, and to always be interested in learning and growing outdoors. Nicole: I really want the children to leave with keen observation skills. We’re constantly asking: “I wonder why . . .” I want them to continue to ask increasingly complex questions and remain curious throughout their lives. But I also want them to consider themselves helpers and agents of change—to realize that the outdoor spaces belong to everyone—and to know that even as young people they can make a positive change. That’s pretty powerful. Britt: We are not trying to create the next park rangers, animal rehabbers, or nature educators at Nature’s Way. While these outcomes are wonderful, we know that many of our students will go on to incredible futures in science, math, politics, parenting, entrepreneurship, art, athletics, and more. I would like each child to leave our program with confidence in his or her own abilities, and with the feeling of community. I hope their minds are prepped for endless curiosity, not just the ability to hold information.